No wiring or electricity is required to install these solar-powered path lights. They soak up the sun's energy by day and shine brightly at night. The warm white LED lights illuminate pathway, walkways, gardens, and patios. 1. If the light does not work at the first time you use, please turn on the light and then put it under the sun for 6-12 hours. The light should work again after recharging. 3. If the soil in your garden is quite solid, we recommended that you should make a hole on the ground before inserting the spike. Weather Resistant - They are made of corrosion resistant stainless steel for long lasting durability, Never worry about exposing the light to the rain or snow. The light can work normally under all kinds of weather with the waterproof rating of IP44 and weatherproof. Save Energy - No need electricity. They're powered by the sun, using solar light in the day and powering them up at night. The LED lamp charged by sunlight for 4 to 6 hours can provide 6 to 8 hours illumination, realizing energy saving. Easy Installation - No tools or wires needed, just turn on the switch under the cap, then pull out the bottom spike, install it and insert the lamp into the garden soil. It just takes a few seconds. 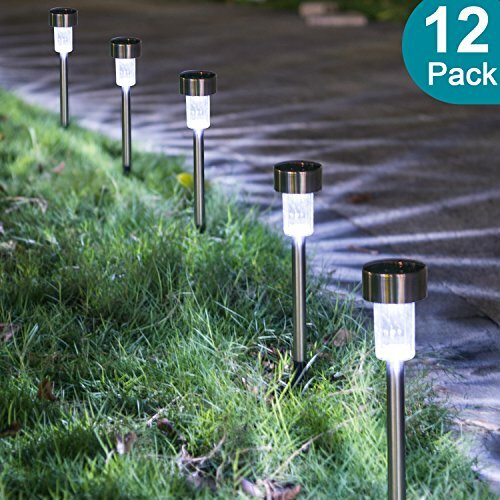 Wide Application - The solar pathway lights' bright clear light shines forth from each LED light. Perfect for any path. you can place them on the walkway, patio, garden, driveway,lawn, yard landscape or any other outdoor spot to light up the night.